The purpose of this award is to give special recognition to spouses and widows of Adjutant General’s Corps Regimental Association (AGCRA) members for contributions of outstanding significance for service or support to Soldiers (primary) and / or to the Department of Defense, Army, or AG Corps. Approval authority for this spouse award resides with the AGCRA National Executive Council (NEC). Spouses / widows of all AGCRA members. The AGCRA NEC will determine the status of “domestic partners” on a case-by-case basis. Although this spouse award is named after two prominent female spouses in our Corps’ and Association’s history, the award itself is gender neutral. 1. Spouses / widows who provide outstanding service directly to or in support of Soldiers and / or their Families. Examples – lead a unit Family Readiness Group; lead a Gold Star Family support group. 2. Spouses / widows who provide outstanding service to the DoD, Army, AG Corps, AGCRA, and / or the local community. Examples – lead a scholarship program for Soldiers and / or their Family members; serve as an officer for an AGCRA Chapter; serve as a committee chair for a DoD / Army sponsored program; lead a charitable organization within the local community. 3. Spouses / widows who have established a pattern of excellence, as recognized by previous accomplishments (e.g., Commander’s Award, Community Recognition). 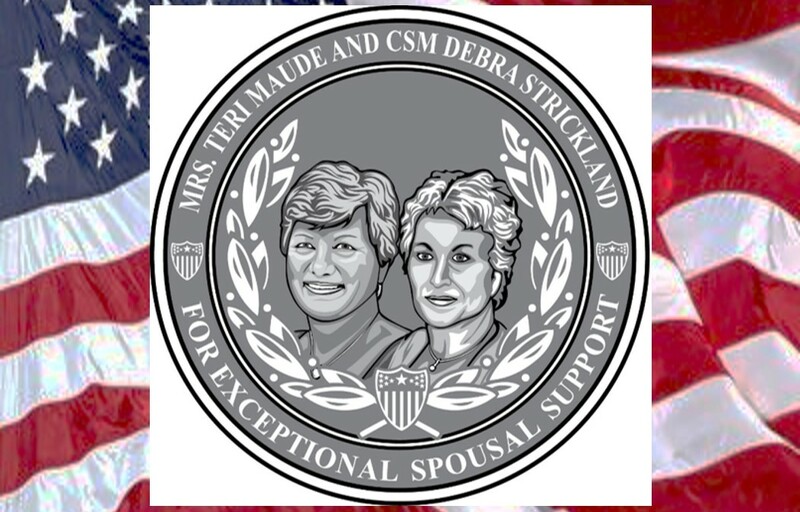 The “Teri Maude and Debra Strickland Spouse Medal” is established to recognize the contributions and achievements of all AGCRA spouses / widows at the National Association level. The award is named in honor of Teri Maude, wife of LTG Timothy J. Maude, killed in action at The Pentagon on 9-11 while serving as the Army Deputy Chief of Staff, Personnel (DCSPER), and Debra Strickland, wife of SGM Larry Strickland, killed in action at The Pentagon on 9-11 while serving as the Sergeant Major for the Army Deputy Chief of Staff, Personnel (DCSPER). Teri Maude was instrumental in establishing The Maude Foundation after LTG Maude’s death. Through The Maude Foundation, Teri was the catalyst to provide financial support for Soldiers in the Army’s Green to Gold Program. Additionally, starting in 2007 The Maude Foundation began hosting the Maude Leadership Lecture Series at the Soldier Support Institute at Fort Jackson, South Carolina, which is now sponsored by AGCRA. The Lecture Series provides AG students with increased opportunities to enhance their leadership skills and classroom training by engaging with current and former leaders of the Army. The Maude Foundation dissolved in January 2017 and AGCRA now carries on nonprofit organization incentives on behalf of LTG Maude’s name. Teri also served with distinction as a Department of the Army (DA) civilian employee at United States Army Europe and The Pentagon and received the Civilian Patriotic Service Award and the Superior Civilian Service Award. Debra Strickland was instrumental in establishing the Larry L. Strickland Educational Leadership Award (SELA). SELA is a non-federal award sponsored by the Association of the United States Army (AUSA). The award honors the memory of SGM Larry L. Strickland, representing all Soldiers and civilians lost during the global war on terrorism. SGM Strickland was an outstanding Soldier who cared deeply about mentoring members of the Army’s Enlisted force and who believed, “if you educate the NCO, you educate the Soldiers they lead.” The SELA is awarded on an annual basis to an Army NCO who exemplifies the Army’s vision and mobilizes others in shaping our future leaders while practicing excellent stewardship of the Nation’s most precious resource – Soldiers. Debra Strickland retired after 36 years on active duty including deployments to Afghanistan after the 9-11 attacks. She served as the Command Sergeant Major of the Installation Management Agency in 2002, and the first Command Sergeant Major of Installation Management Command when it was formed in 2006. She was a fierce advocate and strong supporter for quality of life issues and worked in the development of programs such as the First Sergeant’s Barracks Initiative. $30.00, borne by the recommending authority. Any person having firsthand knowledge of a spouse’s / widow’s achievement or service which meets the award criteria, can recommend that individual for this award. Recommendations, in memorandum format, will be forwarded by e-mail (preferred method) to awards@agcra.com, or mailed to the Adjutant General’s Corps Regimental Association, ATTN: VP for Awards, P.O. Box 10026, Fort Jackson, SC 29207-0026 as early as possible, but not later than 30 days prior to the requested presentation date. Recommendation must be endorsed by the local AGCRA Chapter President or senior Adjutant General Officer. If no Adjutant General Officer is available, a senior Human Resources professional will endorse the recommendation. Once the award has been voted by the AGCRA NEC and approved, payment may be made by check (payable to the AG Corps Regimental Association) or credit card. Credit card transaction can only be processed by the AGCRA VP for Awards. The AGCRA NEC will review award recommendations and base their vote on the merits of the achievement(s) or service. For approval of the recommendation, a simple majority of the members of the National Executive Council present and voting is required. Certificates for approved recommendations will be provided to the President of the Association for authenticating signature. When signed, the certificate and medal will be mailed to the recommending authority. If mailing has to be expedited, recommending authority will cover the costs. Award recipients will be published in “1775”. Presentation of medals and certificates will be made with an appropriate air of formality and at fitting ceremonies such as AG Balls, anniversary celebrations of the Adjutant General’s Corps, or AGCRA Chapter activation, activities, breakfasts, lunches or retirement ceremonies. All awards will be recorded by entering the recipient’s personal information in a database maintained by the AGCRA VP for Awards. This database will be reviewed as part of the approval process. In the unlikely event that information becomes known that a fraudulent award has been made, or dishonorable conduct is substantiated, the National Executive Council can revoke this award, annotate the database, and notify the individual of the action.